​ Tsai Feng, is an active pianist and award-winning piano teacher. She is very proud of receiving her Master of Music Degree in Piano Performance and Pedagogy from the world-renowned St. Petersburg State Conservatory in Russia. Her students have won many national and international auditions and competitions. In 2013, Tsai Feng and Xu Duo moved to Spokane Washington. Since then, their students have become top prize winners in all competitions in the Spokane area, such as Musicfest, Solo and Ensemble Competition, Spokane Youth Symphony Concerto Competition and Spokane Symphony Young Artist Violin Competition. She is a member of Music Teachers National Association (MTNA). Bachelor of Fine Arts from Fort Wright College. Master of Music from University of Southern California. Performances with Spokane Symphony Chorale. Past Chair of Holy Names Academy Music Department. Along with music degrees from Whitworth University, The University of Illinois, and Longy School of Music, Betsy brings a lifetime of experiences in teaching piano lessons and music classes with all ages, and has enjoyed a variety of opportunities working with students from many age groups and musical backgrounds. 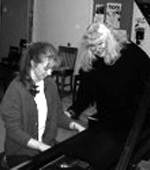 She offers individual piano lessons as well as musical small-group classes for all ages. For twelve years, she was a teacher of piano teachers and also instructor of Dalcroze Eurhythmics at the University of Saint Thomas, and for nearly twenty years, a faculty member at the Saint Paul Conservatory of Music in Saint Paul, MN. These experiences have allowed her to develop a lively yet artistic approach which involves the “whole person” in music making which includes singing, improvising, and whole body movement, exploring music fundamentals while learning pieces from our great heritage of piano repertoire. Studied with Margaret Ott in Spokane. Bachelor of Arts with special honors in music from Yale University. Master’s of Music from Juilliard; studied with Josef Raieff. Winner of William Petschek Scholarship and competitive piano minor teaching fellowship. Experience with Martha Graham Company in New York. Premiered multiple works written for dance, invited to showcase Robert Muczynski’s work at Music Teachers’ National Convention of 1990, and revived 20th Century music for modern dance. Taught at Florida State University. Featured soloist with Spokane Symphony, Washington-Idaho Symphony, and Yale Symphony. Winner of Young Artist Award of Spokane Allied Arts Festival (now Musicfest), State and Northwest divisions of the Music Teachers’ National Association High School Piano Competition and numerous local awards. Composer, soloist and accompanist with Spokane Opera, and faculty member at Gonzaga University. Bachelor’s Degree from Whitworth College; studied with Margaret Ott. Teaching experience: Whitworth, Gonzaga University, and summer institute at University of Southern Oregon 2000-2002 where performed with Heifitz protégé, violinist Sherry Kloss. 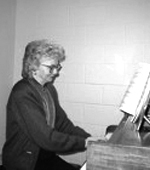 Principal keyboardist of Spokane Symphony from 1984 until her retirement in 2008. Featured soloist with Connoisseur Concerts, Northwest Bach Festival, Spokane Symphony, Cathedral and the Arts, other area orchestras, and Spokane Public Radio. Speaker at the Washington State Music Teacher’s Associations State convention. Winner of Individual Artist of the Year of Spokane City Arts Commission in 1998. Recorded 2 CD’s. Adjudicates locally and across the state. Co-founder and director of Honors Chamber Music Program and Chamber Music Week at Holy Names Music Center. Janet Dodd is happy to join the staff and community of Holy Names after starting last year as accompanist for the Mukogawa Choirs and Ensemble, with Director Andrea Olsen. She brings great diversity with her 30 plus years of private teaching, church music leadership, and collaborative multi-instrumental endeavors in the community. Classically she trained in Portland with Steinway Artist Mark Westcott, Portland State’s Harold Gray, Don Lehman of George Fox University, and at Lewis & Clark with Lee Frick, where she was the first recipient of the Nellie Tholen Music Scholarship. She performed as a soloist in those days, specializing in Romantic Era pieces including the Liszt B Minor Sonata. Janet has always loved teaching and catering her coaching to diverse interests and needs. At student recitals you might hear a Chopin Nocturne next to a Piano Guys Waterfall, or the latest piece from a video game…or a student sing, accompanying themselves on guitar or piano. She believes in developing mindful focus and study for skillful ways to learn music. Janet will encourage and teach performance skills, but is much more interested in encouraging life-long learning and self-discovery over competitive short term goals. Currently you may see her accompanying choirs or solo ensemble students, at Holy Names or in the public schools. You may also see her in area Festivals singing and playing guitar with her husband Brett Dodd (mandolin/guitar). They currently serve on the Inland Northwest Bluegrass Music Association’s Board. Or you may see her playing accordion or bass with a local Brazilian Choro Group. Or sneaking away to bike the trails behind Holy Names….what a great place to be a part of the community of life-long learning! “A pianist of ‘class,'” as one critic describes her. “It is playing that is, first and foremost, musically interesting, immediately holding one’s attention and continuing to reach out to hold that attention…. interpretively engaging.… She is an intelligent and warm pianist, exceptionally proficient technically.” Her recitals have also been noted for possessing “a broad repertoire,” “a fine sensitivity to musical expression,” and “stylistic understanding.” She is known for her “thoughtful,” “memorable” performance. As a Dame Myra Hess Memorial Concert artist, she had her Chicago recital live broadcast across the country via WFMT Radio Network. Recipient of the Artist Presentation Society Award, she appeared as recitalist in many cities in US. She has performed with numerous symphony conductors, and was featured as soloist in Brahms’ First Piano Concerto at the summer music festival in Krannert Center for the Performing Arts. Her recent recital featured J. S. Bach’s complete Inventions & Sinfonias and Schumann’s Kreisleriana. At the University of Illinois at Urbana-Champaign, where she received a University Fellowship, she majored in piano performance for the programs: BM, MM, and DMA. She taught piano performance at Millsaps College (Jackson, MS) as Visiting Assistant Professor, at the Blue Lake Fine Arts Camp (Twin Lake, MI), and at the University of Illinois as teaching assistant; and adjudicated auditions and competitions in Illinois, Mississippi, and Washington State. She is listed in Marquis Who’s Who in American Education. Her many-faceted musical activities includes harpsichord, on which she has performed Bach’s Fifth Brandenburg Concerto and recorded 20th century repertoire by Bartók and Ned Rorem.